The Single Stranded DNA Binding (SSB) family of proteins are ubiquitous to life. Structurally they are characterised by their oligonucleotide oligosaccharide-binding fold (OB fold), which binds to the single stranded DNA (ssDNA) substrate. Functionally they act in a number of cellular processes where ssDNA is exposed, such as DNA replication and DNA repair. They act by binding the exposed ssDNA, protecting it from nucleolytic degradation and attack from reactive chemical species. SSBs also function to stop the formation of secondary structures, prevent DNA re-annealing until appropriate and in the recruitment of protein partners. In humans two structurally distinct classes of SSBs exist. Replication Protein A (RPA), is a heterotrimeric polypeptide, widely believed to be a central component of both DNA replication and DNA repair pathways. Mammalian cells have long been thought to rely exclusively on one SSB, RPA, to perform repair function, however recent discovery of two other members of the SSB family in humans (hSSB1 and hSSB2) challenges many of the established models of DNA transactions involving ssDNA. Theses proteins are much more closely related to the bacterial and archaeal SSB families than RPA. hSSB1 has recently being described to have a central function in the repair of double strand DNA breaks (DSB) by homology directed repair (HDR). Unlike RPA however, hSSB1 appears to be dispensable for normal DNA replication. 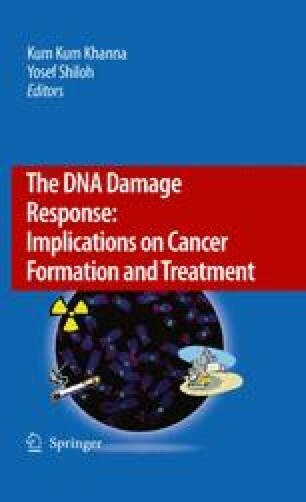 This chapter aims primarily to review the function of RPA in the DNA DSB repair process. It will also examine to some degree the implications of the recent discovery of hSSB1 and hSSB2 as well as look at the potential of these proteins as anticancer therapeutic targets.